The College of Engineering’s expansive building projects are forging cutting-edge partnerships with real-world impact. A thread runs through the College of Engineering’s far-reaching construction plans. It’s research. Yes, the college needs the space. This is, after all, the first major construction in two decades. Yes, the college needs the updated digs. You can only upgrade classrooms and labs so many times. Yes, the collaboration between the colleges of Engineering and Science will spur creative juices. But down deep, the main attraction is research. Engineering Dean Bill Carroll and science Dean Paul Paulus say the bottom line is that premier universities with premier facilities attract premier faculty and students. These ambitious projects, they believe, will deliver that. The Engineering Research Building is scheduled to open in 2011. Collaborations in research and teaching are about to change the face of UT Arlington. Construction is progressing on the state-of-the-art Engineering Research Building—an instant landmark that will forge partnerships between engineering and science by providing space for both. Upon completion in January 2011, the ERB will be the third-largest building on campus with 234,000 square feet of multidisciplinary research and teaching labs and classrooms, faculty and graduate student offices, administrative offices, conference rooms and support areas. Part of the Engineering Research Complex, the $116 million ERB is the largest capital project in UT Arlington history, representing $70 million in tuition revenue bonds, $40 million from The University of Texas System and $6 million from the University itself. 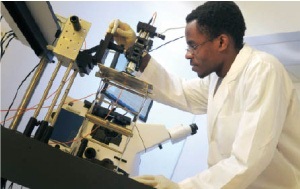 Graduate student James Nyagilo works in one of four UT Arlington laboratories equipped to advance optical medical imaging research. The building is being designed to achieve LEED (Leadership in Energy and Environmental Design) Silver certification. Energy-saving features include light-reflecting and green-roof surfaces, window designs and shading that increase the use of available light and reduce heat transfer, capture and storage of rain and condensation for irrigation, and use of recycled building materials. The Engineering Research Building and the expansion of the Engineering Lab Building, combined with new pedestrian walks to the east of Nedderman Hall and south of the lab building, will form an Engineering Research Complex and Engineering Quad, completely transforming the north side of campus. College of Science Dean Paul Paulus believes the ERB will greatly enhance faculty and student recruitment. The heart of the project involves collaboration. Dr. Paulus says many sciences need computer technology and expertise to solve problems. Groups of researchers working in the same building foster such collaboration. By elevating UT Arlington’s research profile, the project will help position the University more prominently in the region and the nation, Dr. Carroll says. Last summer was busier than usual for Nur Yazdani. The Civil Engineering Department chairman was preparing to open and move into the $10 million, 26,000-square-foot Civil Engineering Laboratory Building. Situated near Maverick Stadium, the CELB is designed to accommodate the increasing number of civil engineering faculty, staff and students. The new lab allows for expansion. The building facilitates the testing of full-scale or prototype structures. “We’ll be able to test underground infrastructure, asphalt pavements, full-scale building/bridge components, landfills and foundation structures,” he says. 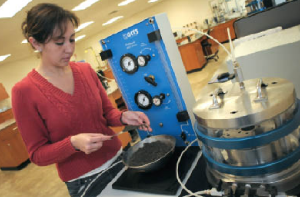 In the existing labs in Nedderman Hall and the Engineering Lab Building, testing facilities are limited. Yazdani says the department has an excellent record of experimental research funded by local, state and national entities that has yielded valuable results for infrastructure challenges. Creating breakthroughs in optical medical imaging is the goal of the UT Arlington Optical Medical Imaging Center at UT Southwestern Medical Center at Dallas. Dedicated in September 2008, the facility combines the engineering expertise from UT Arlington with the medical expertise from UT Southwestern. Five engineering professors—Hanli Liu, Kambiz Alavi, Georgios Alexandrakis, Digant Davé and Karel Zuzak—are conducting research in four laboratories/offices in the new Bill and Rita Clements Advanced Medical Imaging Building on the UT Southwestern campus. Specially designed laboratories give graduate students like Claudia Velosa the hands-on research experience that prospective employers are seeking. Among the research at the new cooperative is the development of a DLP® Hyperspectral Imager for surgical and clinical use, conducted in association with Texas Instruments. “It involves enhanced mapping and imaging to make gall bladder removal surgery safer,” Dr. Behbehani says. U.S. Rep. Joe Barton secured $3.1 million in federal funding to launch the project.